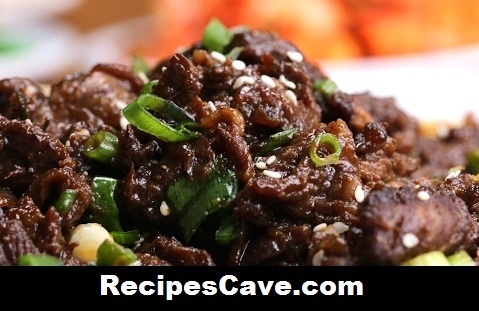 Korean Style BBQ Beef Recipe - If you are beef loving foodie then this is another new style look like BBQ, its from Korean people. Korean recipes are very tasty and healthy though they eat some dog, cat, monkey, snake. Wak Wak don't need to hear more right now. Let's see how too cook beef in bbq style. Slice the beef as thinly as you can, then set aside in a large bowl. Having frozen or cold beef makes the slicing easier. In a blender or food processor, blend the onion chunks, garlic, pear, spring onion pieces, brown sugar, pepper, soy sauce, and sesame oil until smooth. Pour the marinade over the beef, add the onions, then mix evenly. Cover with cling film and marinate for at least 30 minutes in the fridge. Being careful not to crowd the pan, sear the marinated beef and onions until browned, then sprinkle with the spring onions and sesame seeds. Serve with the rice and side dishes. So your Korean BBQ-Style Beef Recipe is ready to taste.